A story of jurisdictions within the Scottish Rite body of Freemasonry. 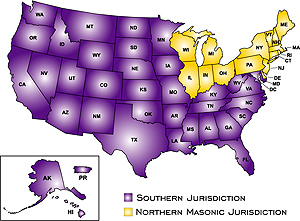 When I joined the AASR (Ancient Accepted Scottish Rite) in 2012, no one told me that there were two jurisdictions within the order (in North America, let alone the different versions which exist globally). All I knew, was that when I took the tour of our new cathedral (The Valley of Chicago) it felt like both a country club and a great fraternal organization to be a part of. Let’s explain for the brothers who might not know about the two jurisdictions or empires as I jokingly referred to them. We begin in the fog of antiquity. There are some documents and writings which suggest that the Scottish Rite was active in the 1730s in England, but I am not here to debate the origins. I will talk about what we know. We know that the Scottish Rite was basically a bunch of Scottish Masons who left Scotland to go to France. Some say they (the Scotsmen) were defectors, but this is not official. After a stay in France these Scottish Masons were tired of their Masonry being diluted with French culture (again, additional speculation), so they left and took with them the system of degrees. They adopted a new motto, a latin phrase, “Ordo Ab Chao” meaning Order Out of [from] Chaos. Most would agree this phrase was adopted because it refers to the chaotic status of the Rite during the preceding years, in plain language, it was a mess, but no longer. Well, ….kinda. There were still a few rogue groups of Scottish Rite enthusiasts way up in the North and North East (“Cerneauism”) They were ordered to get their stuff together, and they did. In 1806 the Supreme Council of The Northern Masonic Jurisdiction was formed, holding precedence over fifteen states, the remaining thirty-five plus Washington DC and Puerto Rico being under the Southern Jurisdiction. Coming back now to the year 2012, there I was sitting in the theater of the VOC (Valley of Chicago) receiving my degrees over an amazing three days. I remember at the time I was working a 1st shift job, I woke up at 4:30 am, worked 9 hours then got dressed and went to the reunion at night. I was super tired. Nevertheless, I had a great time. I was introduced to the awesome system of Scottish Rite Degrees. During that reunion, the Valley of New Orleans had come up to share in the fellowship and put on a “Red” third degree. That degree was amazing, but is a story for another time. Over dinner I sat with the Brothers from New Orleans and that is when I first learned of a difference between our two jurisdictions. I was thoroughly confused. The Brothers from New Orleans advised me to check out the Master Craftsman Program, which is a correspondence course set up by the Southern Jurisdiction to help us understand the degrees and gain better insight. So needless to say, I did it. I started the MCP (Master Craftsman Program), and that's when I realized that these degrees were different. Not just a little, a lot. The names were different, the degrees were different, the messages were different, not one thing was the same, not even the “Royal Secret”. When I looked to the all powerful Internet for further information, there were no official statements or even articles which explained the differences of these two organizations. There was nowhere to turn other than forums like Reddit. So I really hope this article helps anyone who was in my situation. Well, it wasn't long before I decided I needed to see this “Southern Jurisdiction” first hand. Lucky for us, this was easy. Both jurisdictions recognize each other, although if you see a degree in either jurisdiction it doesn't count if you are a member of the opposite. And now I knew why. The answer? Because they are completely different. You would think that the AASR is the AASR no matter where you go, but it isn’t. I talked to my good friend, mentor and SR brother, Frank about visiting the Valley of St. Louis. Then I called the Valley of St. Louis and inquired what I needed in order to attend their Spring Reunion. The secretary advised me to bring my current dues card and my cap. ( I thought, I guess I have to buy a cap?). I asked if there was a fee for us to pay, and there wasn’t. I asked about hotels in the area, and they gave me a bed in the dorm for free. Apparently this trip was going to cost me a tank of gas, and that’s it. I was excited. My next step was to ask my Scottish Rite Mentor, Frank about these caps. Frank loaned me one to wear on my stay. At this point, all I knew was that the hospitality at the Valley of Chicago wore the typical black cap. Turned out, in the SJ, everyone wears a cap. I later bought one while at the Valley of St. Louis. So, I got down there, had a great tour, stayed in the dorm, was fed meals and given drink. It was definitely Brotherly love in action. I didn’t know what exactly to expect when I saw the degrees of the SJ. I had a little grasp since I had done the MCP, but again I thought, “How different could it be?”. The answer again was COMPLETELY. I’d like to outline a few things and differences between the NMJ and the SJ, between these seemingly amicable empires who strive so hard to spread light among brothers. The first thing which strikes a difference between the NMJ and SJ is the degrees themselves. In fact this is probably the biggest difference. The easiest way to describe it, is that where the SJ maintains the look and feel of a traditional degree, complete with an alter, VSL (Volume of Sacred Law) and various implements associated with the degree, the NMJ uses only a scripted play, no altar, no aprons just a skit which should impart the lessons contained. The SJ tends to style each degree as most blue lodge and York Rite members are accustomed. There is an explanation of the degree, a password (in some degrees), specific aprons and esoteric fundamentals explained. Most of all, each degree in the SJ is set up where it feels like a lodge being opened and closed with a small drama in-between and a typical explanation on the meaning and secrets of the degree after. The NMJ, usually starts with a preface, and then explodes into what I can only describe as “Broadway”. There isn't an explanation into the mysteries per say, but rather a specific “take away” that the degree team hopes you have seen and realized. Further the NMJ uses “passports” which you have stamped after each degree in order to keep track of what you have seen and also each page which has the title of the degree also has the “take away” or moral lesson printed therein. No passwords, no grips, no aprons. Just a performance with a message, which is pretty modern. In short, the NMJ was a modern adaptation of a play, where the SJ was a ritual that you watched, like a play. I hope that makes some sense. Further differences between the two seem to be that, as I stated before, in the NMJ, the black hats worn by members are typically worn only by the hospitality (Although this varies by state and sometimes particular valley.) whereas in the SJ, they are given to each member as a part of their initiation into the Rite (again this varies from valley to valley). On the whole, all members regardless of how they got their hat, are encouraged to wear their black hats at all SR events in the SJ. The basic membership or 32nd degree members in the NMJ typically do not wear caps. Another interesting difference is the emphasis on the 14th degree and it’s ring. In the NMJ little is mentioned about this ring whereas again, in the SJ there is an explanation of it and sometimes one is given to each candidate. This practice has been suspended in many valleys due to the cost of buying a ring for each candidate, nevertheless, candidates who have received the 14th degree in the SJ are encouraged to acquire and wear this ring and to wear it always until which time IF they are chosen to receive the honorary 33rd degree. The NMJ really focuses on the Fraternity aspect or even social qualities and really emphasizes the 32nd degree. There are a great many more differences as well, for instance in some valleys in the SJ, the members perform a public play for the profane (uninitiated), this play is actually the 20th degree of the NMJ. It deals with George Washington and Benedict Arnold. What is a private degree for the NMJ is a public event in the SJ. The 4th degree of the NMJ in many cases is given as a video presentation and is kind of a “general preview” of what to expect in the degrees of the AASR NMJ. According to some sources, the 4th degree video was originally intended to be a promo for the AASR NMJ for Masons and their families, and possibly to give them an idea what the SR was all about and somewhere along the line, it just became the 4th degree. The 4th degree in the SJ is again, more of a lodge ceremony similar to the blue lodge and York Rite degrees. The degree structure in both is a bit different as well, in the NMJ and SJ the 4th through 14th degrees are under what is called “The Lodge of Perfection”. However, after this there are some differences. The NMJ then confers the 15th and 16th degrees under what is called “The Princes of Jerusalem” while the SJ confers the 15th through18th as the “Chapter of Rose Croix”. The NMJ confers the degrees in the “Chapter of Rose Croix” in just two degrees, the 17th and 18th. From there the NMJ confers the 19th through the 32nd under the “Consistory”, while the SJ confers the 19th through the 30th under the “Council of Kadosh” and finally, the 31st and 32nd as the consistory. After seeing degrees in both jurisdictions it was apparent to me that both merit applause. Hard working Brothers, putting on the best degrees they can for the betterment of the AASR. I will continue to receive degrees in both jurisdictions because they are complementary in certain ways. Still after all this had a question, “Why the difference?”. Why was the SJ just rocking these revised Albert Pike rituals and why did the NMJ decide to revise and in many cases continually revise degrees? While there seems to be no “official” language, there is speculation on the reasons for the contrast. One reason often cited, was that Albert Pike being a confederate officer, the status of which, was “held against him” and so the North refused the degrees he rewrote, siding instead with the Charles T. McClenachan version, which was a re-write of Pike’s re-write. Although there is often stated that there is no contention between these jurisdictions today, writings often refer to these jurisdictions as “rivals” in the early days. Also, it should be noted that the Charles T. McClenachan version of ritual was from what I have researched, not a re-write of any published work of Pike’s, but a re-write or updating of Pike’s unofficial ritual, Magnus Opus and that Charles T. McClenachan used parts of the never published “Secret Directory” which was a hand written explanation of degrees in a five volume set that the NMJ had acquired. Another often cited reason for the differences is yet another objective opinion which harkens to the idea of the “Northerner’s need for progressive and liberal changes.”. In this notion it is supposed that the “old degrees” hold no truth for today’s Freemason, and that the degrees need to be updated continually to be properly understood. This was accomplished by updating the degrees and rewriting them to showcase more familiar and relatable concepts while trying to maintain the original “take-away” or lesson of the degree. Essentially a modernization in an extreme form. What I find interesting is that if this is indeed true—that the degrees need updating to be understood by today’s Mason, why then have the blue lodge craft degrees not done this? I would say personally, that no degree needs updating, but that is my humble opinion. To revisit the idea posed earlier, that there is no contention and that today both jurisdictions work in unity together, is an accurate statement as it relates to visitation, recognition and cordiality, but is what I would describe as a partial facade when it comes to the attitudes of individual members and their beliefs about the “other guys”. In my travels, I have found that members believe in the superiority of their system, although they respect and recognize each other. Of course there are jokes about the respective “camps” on both sides. In fact while in the Valley of St. Louis, I was told, “We don’t have any fancy submarine degrees.”, as he chuckled, and then made a jab about the NMJ having video degrees but it was all in jest. Yes, I did say that degrees are on video. This still comes as a surprise to Masons residing within the NMJ and SJ members as well. It's not something many of us are happy about. But this paper is not for critiquing, rather to advise and educate. As for the SJ, I have heard in my own valley, some rather interesting comments made about the “clinging to old ways” and monologues that “droll on and on…”, referring again to the SJ rituals. There definitely seems to be some underlying animosity. In the end, the AASR, whether you're talking about NMJ or SJ, have excellent systems of moral instruction and degrees. Which ever you join, whether you like it or not, is recognized by the other which means you can visit either one you like. There is of course the problem of degrees themselves being recognized, which they are not. So just keep track of the degrees you see and take notes. I think there is an interesting conclusion to be made, which is that perhaps the AASR is not 32 degrees, but rather 64 degrees with honorary 33rd degrees in both, which again, are different from each other. I hope this aids in your search for light my Brothers. Here is to all 64 errr 66 degrees of the AASR! Below is a video which just came out. It is made by the NMJ I believe in prep for the Scottish Rite Day on November 12th. It has some good history and is only 3 minutes long. Enjoy. References: Scottish Rite Ritual and Monitor, Committed to the Flames, Bridge to Light, Mackey's Masonic Encyclopedia. Bro. Robert Johnson, PM is the Managing Editor of the Midnight Freemasons blog. He is a Freemason out of the First North-East District of Illinois. He is the Secretary of Waukegan Lodge No. 78 and Education officer for the 1st N.E. District of Illinois as well as a past member on the Grand Lodge Education Committee. He is also a member of the York Rite bodies, AMD, The Illinois Lodge of Research and a member of the Scottish Rite Valley of Chicago as well as a charter member of the Society of King Solomon, a charity organization run by the Grand Lodge of Illinois. Brother Johnson currently produces and hosts weekly Podcasts (internet radio programs) Whence Came You? & Masonic Radio Theatrewhich focus on topics relating to Freemasonry. In addition, he produces video shorts focusing on driving interest in the Fraternity and writes original Masonic papers from time to time. He is also a co-host of The Masonic Roundtable, a Masonic talk show. He is a husband and father of four. He works full time in the executive medical industry and is also a photographer on the side as well as an avid home brewer. He is currently working on a book of Masonic essays. If I could make a couple friendly amendments, the Scottish Rite Mother Council was founded in Charleston, "South Carolina". Also, the 33rd Degree is not an honorary degree as they receive the same degree that active members such as Sovereign Grand Inspector Generals do. The title Inspector General Honorary infers that they are an honorary member of the Supreme Council. Thanks for the catch and clarification, Frater! Bro. Johnson the Valley of Chicago came to the Orient of DC and attended a joint Reunion using the degrees of the SJ except one which was conferred by your Valley.The rest was conferred by mine, the DCSR. So the degrees of the SJ do count for those of the NMJ. As the former editor of the Royal Arch Mason Magazine, I walked into my own buzz saw over the jurisdictional titles of 33rds. I was informed by an angry reader that in NMJ they are 33rds and honorary members of the NMJ Supreme Council. In the SMJ they are known as honorary 33rds. BTW, the opposite is an "active," a man who is a voting member of his supreme council. Those 33rds who are not "actives" may attend but have no vote. Bro. Marlon, when I visit an SJ reunion, the degrees can't be stamped. And hence I have been told by my valley they do not count. I suspect there was special considerations in this case you're speaking of. Bro Robert, I think you meant SHIFT job. Ha! I did mean shift. Great catch brothers...although that job probably was...ehem! Well, you know. Thanks again for the catch and for reading! And if you start counting the rituals in other Supreme Councils around the world you get almost another 32 degrees. From what I've seen the rituals are practically the same in all Latin American countries and Spain, and just the translation difference with France and Germany. I do not know the AAR degree status in the British Isles. From my experience, being a dual member in both the SJ and SC of Mexico, most of the degrees are similar, but the Mexican ones are definitely pre-Pike revisions and are even more similar to blue lodge rituals (tokens, passwords, and batteries). For example, while the 4th is basically the same in both Mexico and SJ, the underlying lesson is completely different; lodges of perfection in both systems teach the same thing (in summary), but only a few degrees actually teach the same thing, that is, in most cases some degrees teach what another degree teaches in the other system. Thank you. This explains what happened in a conversation tonight, in Eau Claire Wisconsin, when a visiting Mason from Minnesota recommended the Master Craftsman courses to me. It was clear to me that he did so in good faith, but as an NMJ member, I initially wondered if we were talking about something clandestine.